Christmas season means traditions, and one cinematic tradition during the winter holidays is the release of new fright fare films. All the Creatures Were Stirring and Slay Belles, two horror movies released this week, are well worth adding to your December watch list. 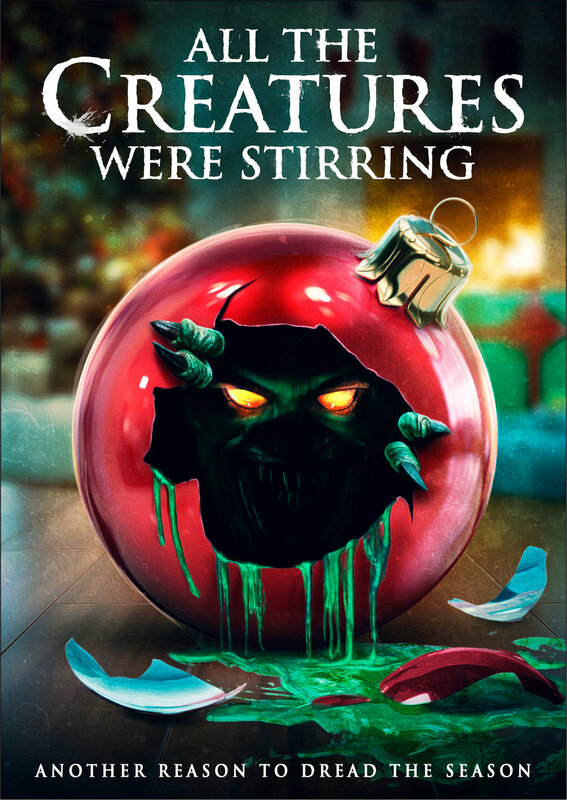 All the Creatures Were Stirring (from RLJ Entertainment) is an anthology film that boasts smart satire and avoids Christmas horror cliches. There are no psychotic Santas here; rather, the husband-and-wife writer–director team of Rebekah McKendry (co-host of the Shock Waves horror movie podcast) and David Ian McKendry offer some unique takes on the holiday season, with shades of The Twilight Zone and The Outer Limits on display at times. The wrap-around story concerns a couple on an awkward maybe-date at a small, no-budget, avant garde theater. The cast presents a series of stories, which are fleshed out with full cinematic flair: an office Secret Santa party that turns deadly, an encounter in an empty parking lot between a man locked out of his car and two strange, young women with a creepy van; a take-off on Charles Dickens’ A Christmas Carol, in which a modern-day Scrooge is visited by three ghosts; a roadkill revenge story involving a man who runs into a deer; and a dinner party that goes awry when some extraterrestrials visit with an annual tradition of their own. The McKendrys do a fine job with their limited budget, with each segment having a different feeling than all of the others. My personal favorite is the parking lot terror tale starring Matt Long as a harried husband shopping late on Christmas Eve, with Makeda Decet and Catherine Parker as the two mysterious women who introduce him to a horrific new role in life. This segment has a vibe to it that will please fans of horror anthologies such as the classic Creepshow. The alien story, which stars Constance Wu as a woman who has much to learn about her boyfriend’s Christmas traditions, is another winner, ending the segments on an upbeat note with a nod to the more sentimental episodes of the original The Twilight Zone television series. Fans of independent genre cinema will have fun spotting favorite talent in starring and supporting roles, as well as cameos. A few of the faces to watch for include Graham Skipper (Beyond the Gates), Brea Grant (Dead Awake), Chase Williamson (Sequence Break), and Amanda Fuller (Starry Eyes). The McKendrys get fine performances from their cast, delivering a film that is a welcome addition to both the holiday-horror anthology sub-genre and to creepy Christmas cinema. Horror comedy Slay Belles (from Epic Pictures and Dread Central Presents) reaches for heights of outrageousness and unbridled B-movie zaniness, with director Spooky Dan Walker serving up a colorful concoction of Christmas craziness that should get everyone involved on Santa’s naughty list this year. Netcast hosts The Adventure Girls — Dahlia (Susan Slaughter) and Sadie (Hannah Wagner) — talk their more down-to-Earth friend Alexi (Kristina Klebe) into joining them for an exploration of the abandoned Santa Land amusement park. Meanwhile, the area locals are concerned with a sudden rash of deaths of young children. When the three young women are pursued by a hairy monster, they are temporarily rescued by an old biker who claims to be — and just so happens to be — the real Santa Claus (Barry Bostwick of The Rocky Horror Picture Show fame). The creature in question is the legendary Krampus, the half-goat, half-demon of Central European folklore who punishes bad children at Christmastime. The gals and Santa must find a way to stop Krampus before he continues his evil attack on the local kids. This is not family friendly fare by any stretch of the imagination, but mature viewers who have a soft spot for 1980s splatterific creature features should have lots of fun with Slay Belles. The cast is game, and Bostwick is terrific as the sympathetic Santa who built an amusement park because the spirit of Christmas started to become lost on Americans. The practical effects on display are a blast, and the Krampus suit is a marvel. Slay Belles is a party movie, probably best viewed with some like-minded friends looking for a fast-paced, gore-filled, egg-nog-drinking and popcorn-balls-munching time gathered ‘round the TV and the Christmas tree. All the Creatures Were Stirring photos courtesy RLJE Films. Slay Belles photos courtesy Epic Pictures. Joseph Perry is one of the hosts of When It Was Cool’s exclusive Uphill Both Ways podcast (whenitwascool.com/up-hill-both-ways-podcast/) and Gruesome Magazine’s Decades of Horror: The Classic Era podcast (decadesofhorror.com/category/classicera/). He also writes for the retro pop culture website That’s Not Current (thatsnotcurrent.com), Diabolique Magazine (diaboliquemagazine.com), Gruesome Magazine (gruesomemagazine.com), Scream Magazine (screamhorrormag.com), Ghastly Grinning (ghastlygrinning.com), and several other print and online film critique and pop culture magazines.